Since I do sales, I am always in the Longwood area a few times a week. Several months ago I noticed a new Hot Dog place that opened where a a Sobik's sub shop use to be located at on West SR.434 in Longwood. I occasionally enjoy a good dog or two, and after eating lots of turkey over the holiday break, I thought a good hot dog for lunch was just what the doctor ordered....So I decided to see what Bite was all about. 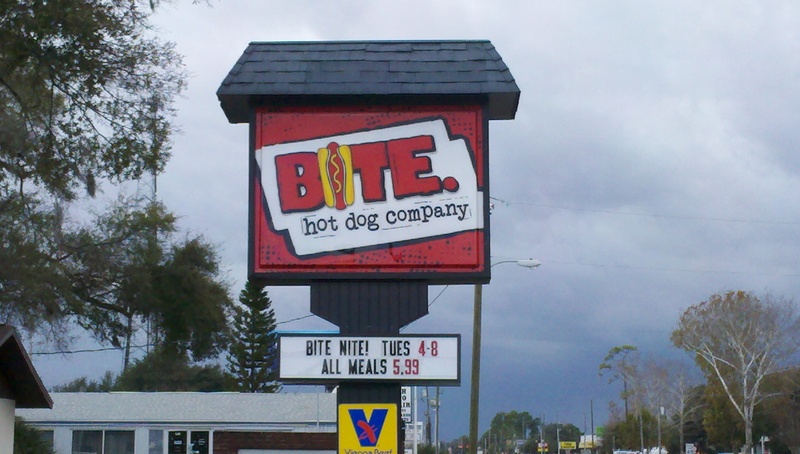 Bite Hot Dog Company aims to "Bring A Taste Of The Windy City To The Sunshine State" according to a sign inside the restaurant. They serve 100% Vienna Beef hot dogs, with a variety of toppings and styles. Bite also serves up all natural fresh cut - skin on french fries that are cooked in 100% peanut oil. You can get them with a combo or order them on the side with chili cheese. They also serve mashed potatoes with gravy, coleslaw and chili,---all of which are available as a topping!! For my lunch break I decided to keep it simple for my first time and went with the Chili Cheese Dog Combo. I decided to increase the heat and make it a spicy dog also, which was a real good choice---it was hot, not too hot...just the right amount to compliment the chili. The chili is available with or without beans. The poppy seed bun was nice and fresh and overall the dog was very good! The french fries were quite tasty also, as they are fresh cut fries. I personally prefer a more crispy french frie (some of the fries were soggy), but nonetheless with a dab of ketchup--they were good, and I could not even eat half of them---it was a large portion of fries! Bite is a neat concept on an American favorite--Hot Dogs!! But be ready to pay a tad more than the guy who sells dogs on the side of the road. A combo with the spicy dog upgrade set me back $8.33 for lunch, but it was worth it. Bite is kind of like a Five Guys for Hot Dogs with a Chi-town style and a rock & roll flair. The tables have salt and vinegar on them, and a condiment station is up by the soda fountain with all the ketchup you need to sop up those french fries. Be sure to sign up for their " Frequent Biters Club" via the little touch screen at the end of the pickup counter to get special offers and deals--Like "Buy One Get One Free" and a "Free Bite" on your birthday. Although the price was a tad more than I expected, they do have specials... like on Tuesday from 4pm to 8pm--all meals are $5.99---and that's a good deal on a good "Bite"
Tastes Of Orlando recommends you take a "Bite" at Bite Hot Dog Company!! Christmas Eve Rib Eye Steaks with Baby Bella Mushrooms! Something a little NON-TRADITIONAL---since most of us will be getting our fill of Christmas Turkey and Ham---we have decided to cook up some Rib Eye steaks---on the grill. That's the beauty of Florida...It's still in the 80's temperature wise here...so we decided to go to the pool and sunbathe, then Cook up some good old fashioned Rib eye's on the grill....on Christmas Eve... which we wanted to share with you! - Rub steaks with a dash of each of the ingredients listed above. - Place steaks on grill and lightly char the entire steak on both sides on the hot grill. Cook for 3 minutes then turn the steak over and repeat on the other side. At that point remove the steak and finish in the oven. - The key to the perfect steak, is allow the steak to rest after cooking. Simply remove the steak from the grill or oven, place on a plate in a warm place for a ¼ of the cooking time. The reason you need to rest the steak is because the meat is all tensed up from the heat of the cooking and you need to allow the meat to relax. - Heat skillet to medium low and melt 1/4 stick of unsalted butter. Once Butter is melted add 1/4 cup of extra virgin olive oil. - Add mushrooms and saute over low heat for about 30 minutes or until mushrooms reach desired tenderness. [" 1. The condition or quality of being completely forgotten:"
Now after reading the definitions, it may indeed sound like a strange name for a restaurant---but not for a taproom. The food and drink served here is very memorable, and not soon to be forgotten...in a good way! I assume that if you stayed long enough and sampled all of the 40+ craft beers on tap you personally may be induced into a state of total forgetfulness, and may need someone to overlook your past offenses while being mentally withdrawn or blank....but that's just my guess!! Oblivion is the creative child of Missy Jahn and Pete Wesenberg. As the website states, Oblivion is the fulfillment of a lifelong dream of Missy's to own a bar & grill and bring the kind of experience, food, and drinks to people that she feels you deserve when spending your hard earned money. Pete is the "creative" guy. He brings to Oblivion a background in film, photography, graphic & web design and marketing. "Chef Goody" has learned his trade both ways, the school of hard knocks and higher education. Starting out as a dishwasher he worked his way up in the industry for 6 years until he was able to attend the Culinary Institute of America (CIA) in Hyde Park, NY. He then worked for nearly a decade for Marriott in New Jersey, Baltimore, Houston, New Orleans, Maui, and Orlando. He has traveled the world in pursuit of great food, taking culinary trips to the Caribbean, Australia, Mexico and the Philippines among others. He has also competed for the last seven years in the largest BBQ competition in the world, the American Royal in Kansas City. Goody knows his stuff when it comes to BBQ, charcuterie, butchering, and even homebrewing. Now that you have some background info--lets get to the grub!! 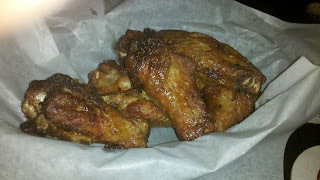 The wings were cooked very well with a lightly crisped skin on the outside. They are seasoned with a homemade BBQ seasoning and then slow smoked and crisped to perfection. The wings are not overly flavorful as some wings tend to be, they had just the right amount of seasoning and smokiness to them. I would recommend them for an app, or if you just wanted to have some wings and beer---you would be good. 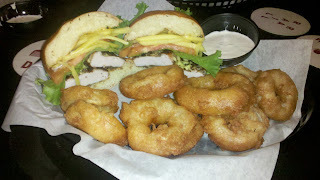 Next it was on to the " Rings of Oblivion"----that's what they call onion rings at Oblivion. Oblivion's onion rings are fresh onions battered in a special beer batter that comes from a beer in one of their taps. The rings were fried golden brown to perfection and were a bit unusual. My wife joked around with me that we should call them Donyun rings---because the batter was so thick, it was like eating a fried doughnut with an onion it. The rings were tasty and good, but because they were so thick they were very heavy---and when you are eating burgers and sampling a few beers---eating a jumbo fried doughnut is not such a good idea. One of the good things about Oblivion and having a great chef like Chef Goody, is the fact that although they have a set menu of food, they are always rotating in good and different specials just like the the 40+ taps are always being rotated. Some things may sound weird, but you may like to try the Scrapple Egg- a delicacy of pork scraps and cornmeal. Often served as a hardened slice from a loaf. 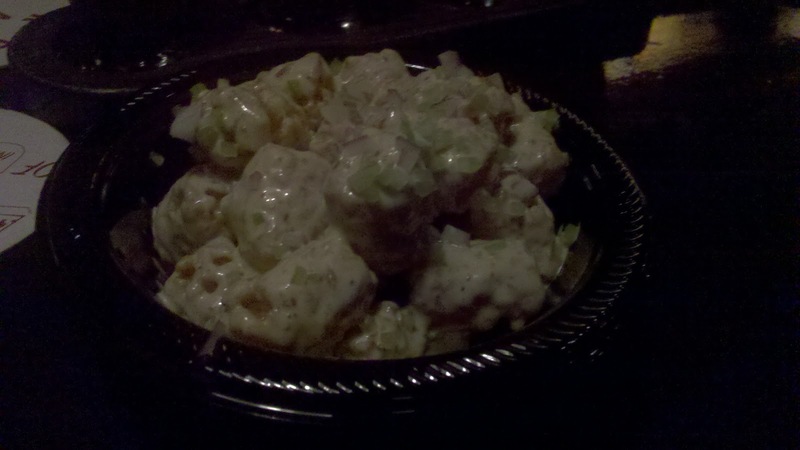 Or perhaps you would like the Fried Black Eyed Peas, or Egg Drop Soup...on our visit, we just had to try the Tater Tot salad. I know it seems really weird....but man o man was this good! !--Cold tots tossed in a sweet and tangy potato salad sauce. I would never imagine cold tots tasting good, and being used for a salad, but it works really well! This was a very spicy Jamaican jerked rubbed chicken breast chargrilled and topped with pickled mango and passion fruit aioli served on a brioche bun. This was a spectacular sandwich that was extremely hot---but it was cooled with the pickled mango slices and aioli...a good choice if you like it hot. The daredevil in you will want to try THE FATASS---(fire grilled patty, Italian patty, pickles, bacon, jalapenos, 2 fried eggs, chopped pork, Tasso ham, griddled onions, chicaronnes, sharp cheddar, smoked bleu cheese, and cheez whiz on a garlic bun----WHEW!!! On our next visit we will certainly try the burgers!! We also found it neat that you can try all types of potatoes---like Potato Wedges, French Fries, Potato Chips, Potato Tots and Sweet Potato Fries with a variety of different seasonings available. Did I mention this is a TAPROOM??? ---well of course no trip to Oblivion is complete without trying one or 10 of their amazing craft beers. You will not find Budweiser or Miller Lite here..all 40+ taps are unique craft brews that change as often as the season does. 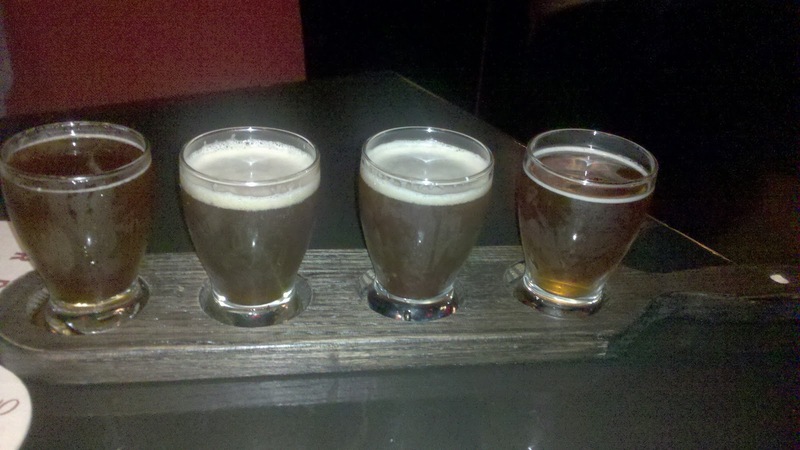 Since it was just before Thanksgiving we opted for a sampler of the Winter seasonal ales. The Winter Seasonal ales included St. Feuillien Cuvee de Noel, St. Bernardus Christmas Ale, Scaldis Noel and one other assorted Winter Ale....all of which were very tasty and almost had a wine like fruitiness to them. Again, as I said--this is a taproom---so no fake beers here! !--They have something for every palate and taste. From India Pale Ales - Amber Ales - Pilsner to Stout---They have it on tap. If you are not sure what to order because the names are unfamiliar...just ask your server or bartender and they will help guide you through making a good decision. Oblivion is just that---a Taproom--with good food---Its not quite a Gastro pub, but more of a good place for food and beer--and not just bar food--Chef Goody really brings the goods. Inside you will find pool tables and steel tip dart boards to play games. You can sit at the bar, or sit at a table or booth. The Decor has caused a lot of debate, because many think its a little too dark inside. The walls all have murals on them depicting skeletons and skulls and the walls are painted black and blood red. You will find no hard plates or silverware here...everything comes served on a plastic plate or basket along with plastic utensils...so although the food is great---it is not served fancy. I have been told this is due to a problem with the aging septic system. Oblivion is making use of the old Straubs Seafood building that has long been closed. I personally did not mind the plastic ware. We found our server and hostess to be very attentive and and we were well taken care of the whole time. The wife and I will definitely return to Obivion sometime soon---(we have to try the burgers) We had a very good experience and enjoyed the food and the brews. I think its a great addition to Orlando and a unique take on a taproom---that serves food. Most other taprooms and beer specialists do not have much to offer for food---but Oblivion has taken the "Bar Food" concept to another level----You should check it out for yourself sometime soon! !